Horses have had a dramatic impact on Josh’s life. They have given him strength, independence and confidence which has helped him overcome some of the challenges of living with Down syndrome. His mom is a physician and she continues to be amazed at the many ways in which riding has improved his quality of life. Horses have helped motivate Josh, who has trouble speaking, to utter words, like “walk on” and “whoa.” His core strength has also improved as the horse’s motion challenges him to sit tall in the saddle. This is especially important because one of the symptoms of Down syndrome is low muscle tone. 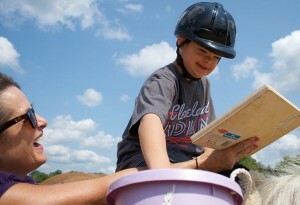 Riding has also improved Josh’s fine motor skills and eye-hand coordination as he works the reins in his hands. He now steers the horse on his own and can make circles and weave through cones by giving and taking with his reins. After four years of riding at Fieldstone Farm, it is now rare for Josh to miss any target while playing games from atop his horse, no matter how challenging it might be. Other areas of improvement include following directions and sequencing as he hears the instructions that are given during class. Beyond that, riding has brought tremendous joy to Josh and his family. And his confidence has soared. 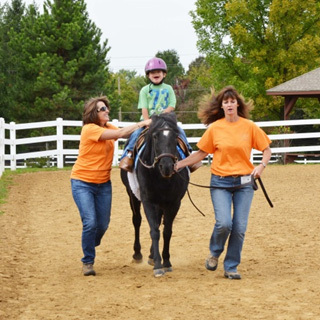 The transformation illustrates how our horses are able reach each of our students in so many different and individualized ways. Josh’s mom can’t imagine a life without horses for Josh and says, “From the moment we pull into the parking lot, my son is so happy to be here and I know it is going to be a good day.” It is difficult for Josh to participate in sports other boys his age play, but horseback riding is an activity in which he excels, enjoys and feels a sense of accomplishment.